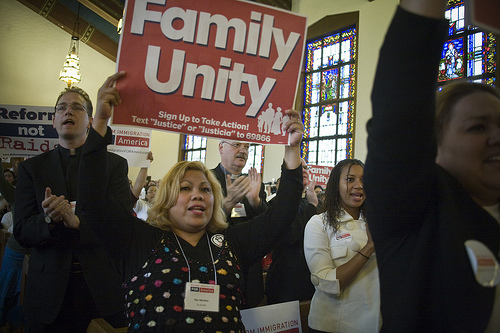 In an unprecedented show of religious support for just, humane, comprehensive immigration reform, religious leaders from across the theological and ideological spectrum and Members of Congress kicked off a nationwide mobilization for immigration reform today on a conference call with reporters. 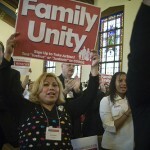 “Together, Not Torn: Families Can’t Wait for Immigration Reform,” includes the delivery of hundreds of thousands of pro-reform postcards – more than a million within the next month – to Members of Congress from people of faith in their states and districts and 100 events across the country during President’s Day recess and into early March. Catholic, Evangelical, Jewish and Mainline Protestant leaders were joined by Reps. Mike Honda (CA-15) and Yvette Clark (NY-11) to press for immigration reform that keeps families together, creates pathways to citizenship and protects the dignity of all workers. Volunteers in Fr. Pedigo’s community are traveling to different parishes, high schools, and area universities to speak about the broken system and the need for reform, and the faith community is hosting a prayer vigil for immigration reform in San Jose next week. Thousands of people of faith at 100 local events across the country throughout the month of February and into March will deliver the moral message on immigration reform to state and federal legislators, reminding them of the urgent need to pass immigration reform that protects our values as a nation.